Vitamin C, also known as ascorbic acid, is an essential nutrient that is naturally found in citrus fruits such as oranges and lemons. 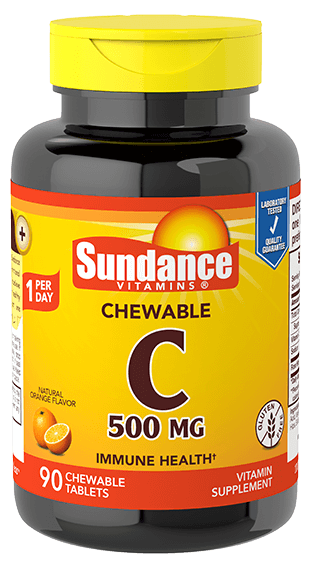 Sundance Vitamins® Chewable Vitamin C 500 mg comes in delicious, natural orange-flavored, chewable tablets to allow you to get the most out of this essential nutrient. Ingredients: Sugar, Sodium Ascorbate, Sorbitol, Ascorbic Acid, Vegetable Stearic Acid, Natural Orange Flavor, Rose Hips, Silica, Vegetable Magnesium Stearate. DIRECTIONS: For adults, take one (1) chewable tablet daily, preferably with a meal.